With my pregnancy I've been craving these cookies something awful, honestly for months. I tried a few things, but nothing was really what I was searching for. Then finally one Saturday towards the very end of my pregnancy I decided that enough was enough and I WAS going to find the perfect recipe... And I did!!! I wish y'all could've seen my big ole pregnant self dance around the kitchen when the first batch came out of the oven... I was beyond happy with the results. Not only did they produce the smell I was hoping for while baking, but they were puffy and chewy and totally delicious. I fell in love! My son woke up from his nap smelling these fresh out of the oven and the look on his face at that first bite so perfectly mirrored my own that I just knew I had done it, I found the perfect recipe. But that wasn't enough, I then proceeded to make every person that came to my house for the next few days also try these so I could get their opinion in hopes that my pregnant taste buds weren't being wonky. 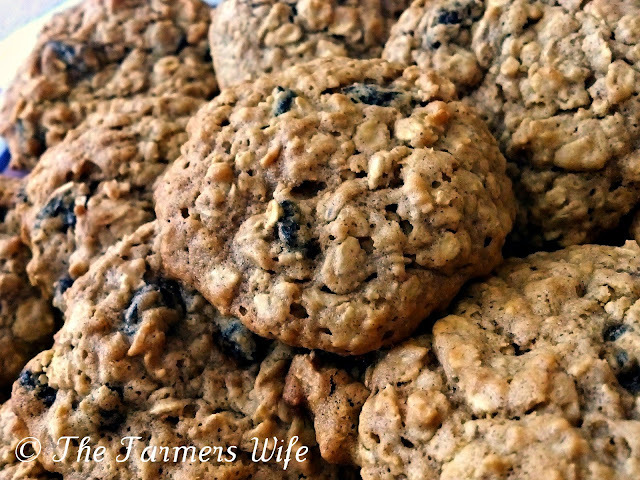 And sure enough they all agreed, it was the perfect balance for an oatmeal raisin cookie!! I was so happy with this success, and I'm so glad to share it with you now!! In your mixer blend the butter, sugar, egg and vanilla til smooth. Then in a large bowl whisk together the flour, baking soda, spices and salt. Add to the butter mixture and mix on low-medium speed until combined. Then add the oats and raisins and mix well. At this point chill the dough in the fridge for at least 30 minutes, up to 1 hour. Once mixture is chilled, spray your cookie sheets with non stick cooking spray, and using a 1 1/2 tablespoon scoop drop scoops of cookie dough about 2 inches apart on your sheets. Bake at 350F degrees for 10-12 minutes, until golden around the edges and slightly golden on top. Let cookies cool on baking sheet for 5 minutes before transferring to wire rack. These were so super easy, the dough came together so quickly I couldn't believe it! The key to keeping these fluffy and chewy is the chilling time though, so do not skip this part! You can also scoop the cookies onto a cookie sheet and freeze them before baking, and once frozen place the rounds into a ziploc bag so that you always have cookies ready to go that just need baked! We give these a 5 star rating, they were just that good! I'm like you about Oatmeal raisin cookies. thanks for the tip about chilling the dough before baking. I do that now with my choc chip cookies, too. OMG! You've save me lots and lots of more failures! I've spent many years looking for those exact specifications for an oatmeal cookie and here you go. I will definitely be giving these a try! They are my husband's favorite and thus far I have failed in coming up with the perfect cookie. Thanks!